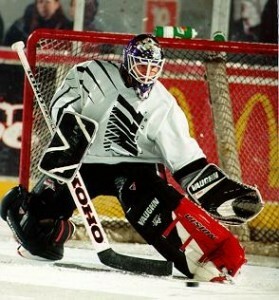 Jeff Salajko (1996-99): “Sal” played 126 games over three seasons and was 74-37-11 with five shutouts. .. In 1996-97 he was 35-14-4 in helping the Chill become the first Columbus pro hockey team to win a division title… Outstanding in the playoff series vs. the Toledo Storm… Also had three assists and 40 penalty minutes in Chill career… Named assistant coach/goalie coach for the Ohio State women’s hockey team in September 2012.